King and Queen of Spain bring joy and excitement to the city, Oxford Mail, 15 July 2017, Naomi Herring. 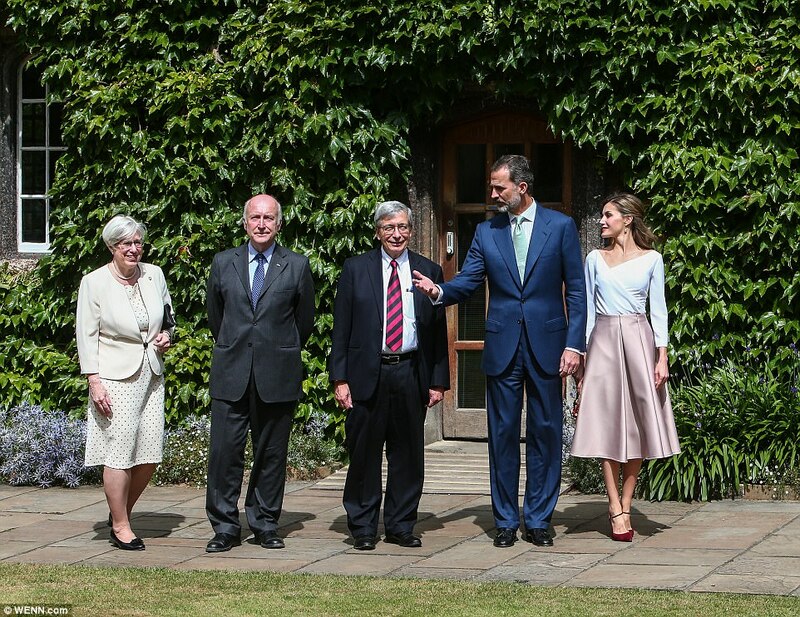 King Felipe VI of Spain, accompanied by Queen Letizia, visited the University of Oxford on Friday on the final stop of their state visit to the UK. They visited the Weston Library where they viewed a selection of treasures from the Bodleian Libraries’ special collections and met staff. At a lunch in the Divinity School King Felipe gave a speech. The royal couple then walked to Exeter College for a reception with Spanish nationals working and studying at the University as well as members of the University engaged in teaching and research on Spain and the Spanish language. Un viaje muy real, Informe Semanal, TVE1, 15 July 2017. Interview with Edwin Williamson, King Alfonso XIII Chair of Spanish at the University of Oxford (6m50). King and Queen of Spain visit Oxford, University of Oxford, 14 July 2017. Viaje de Estado a Reino Unido, Casa Real: Visita de Estado al Reino Unido. SS.MM. los Reyes, en Oxford. 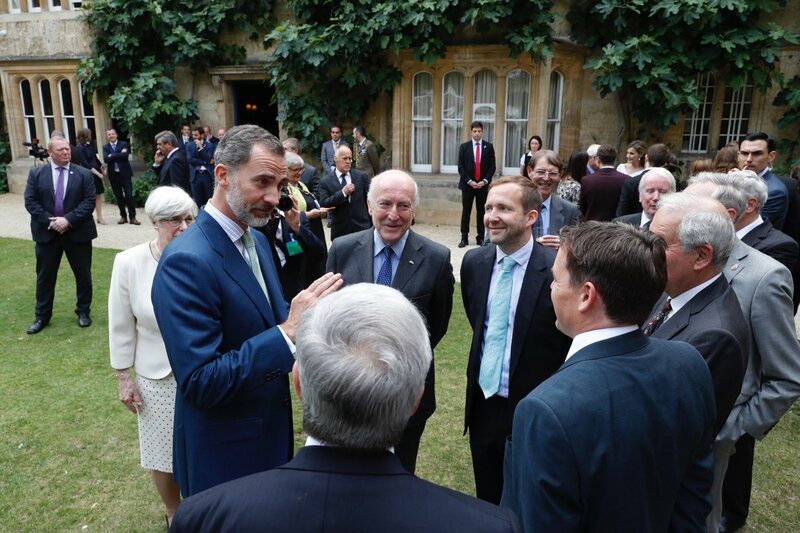 The King and Queen meet with academics researching on Spain at Exeter College - ‘Los Reyes con académicos vinculados a España en el Exeter College’. View video. King and Queen of Spain delight school children during visit to Oxford, ITV News online, 14 July 2017, Mary Stanley. Interview with Virginia Lladó-Buisán, Head of Conservation and Collection Care at the Bodleian Libraries (40s), and with Xon de Ros, Chair of the Spanish Sub-faculty (50s). BBC Radio Oxford, David Prever, 14 July 2017. Professor Sir Rick Trainor, Rector of Exeter College, Oxford, is interviewed ahead of the visit to Oxford of the King and Queen of Spain (1h26m). Los Reyes culminan en Oxford su visita a Reino Unido, El Correo, 14 July 2017, Íñigo Gurruchaga. Felipe VI llama a la "internacionalización" de las universidades a su paso por Oxford, El Mundo, 14 July 2017, Carlos Fresneda. 'John Elliott recibe el premio Órdenes Españolas 2018', 9 May 2018. 'Sir John Elliott receives the Premio Órdenes Españolas Award 2018', 25 April 2018. Kalypso Nicolaïdis, Catalonia and the Theaters of Recognition, OpenDemocracy, 19 December 2017. Sergi Pardos-Prado, 'Catalonia's three ways forward', The Washington Post, 28 October 2017. Interview with Marina Pérez de Arcos, On Catalonia, BBC Radio 4, The World Tonight, 27 October 2017. Interview with Marina Pérez de Arcos, On Catalonia, BBC Radio 5, Breakfast, 11 October 2017. Interview with Marina Pérez de Arcos, Análisis sobre el “plan a medida” de Theresa May, Corresponsales en Línea (La Nación and Clarín), 22 September 2017. Interview with Marina Pérez de Arcos and Rosa Bercero, Españoles en el mundo: Oxford, TVE1, 14 September 2017. Interview with Javier Muñoz-Bassols, 'La gran diferencia en Oxford es el modelo de tutorías' [The great difference in Oxford is the tutorial system], ABC, 15 February 2016. Cervantes-Shakespeare 400th Anniversary Symposium, 28-29 January 2016. ‘Todo sobre el bardo y el ‘manco’ [All about the bard and the ‘one-armed’ man], El Mundo, 29 January 2016. ‘Oxford celebra la "influencia" de Cervantes y "El Quijote" en Shakespeare’ [Oxford celebrates the ‘influence’ of Cervantes and ‘Don Quixote’ on Shakespeare], La Vanguardia, 28 January 2016. ‘Celebran influencia de Cervantes en Shakespeare’ [Cervantes influence on Shakespeare celebrated], El Universal, 28 January 2016. Professor Edwin Williamson appears on BBC Radio 4's PM following the news that the remains of Cervantes have been found in Madrid almost 400 years after his death, 17 March 2015. ‘España quiere recuperar su voz apagada en Oxford’ [Spain wants to recover its lost voice in Oxford], ABC, 5 May 2014. Queen Sofía of Spain’s visit to Exeter College: 'Queen Sofía of Spain visits Oxford University', BBC, 29 April 2014. Oxford Spanish Play: On TVE1 – Spain’s National TV Channel 1 - 3 o’clock news, 29 April 2013. ‘La puesta de largo de Amar en tiempos revueltos en Oxford’ [Amar en tiempos revueltos’ debut in Oxford], TVE1 – Spain’s National TV Channel 1, 21 February 2012. Javier Muñoz-Bassols, Aragoneses por el mundo - Oxford, 2010. Edwin Williamson on BBC Radio 4, Don Quixote, In Our Time with Melvyn Bragg, 16 March 2006.